From his late teens to early twenties, David worn a lot of hats; cabinet and sailboat builder, home restorer, cabdriver, actor, and even a magician’s assistant. Through it all, the call to create was always present. In 1985, with a serious devotion to rustic design using all natural materials, he developed a very ornate bent-sapling construction style named “Victorian Rustic.” By 1990, David had completed a series of branch and sapling construction “dinosaur” sculptures, among many other rustic works. He first conceptualized the idea and early designs of what would become the Big Bugs the following year. 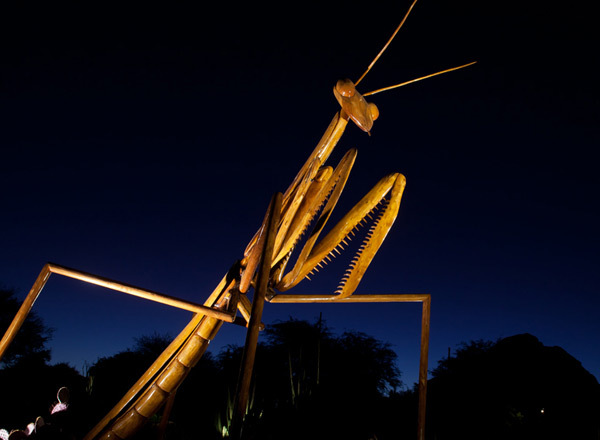 Combining all the materials and techniques of rustic construction and new engineering ideas, he created the first ten sculptures of the Big Bugs exhibit. These sculptures included four different subjects: Ants, Praying Mantis, Spider and Web, and Dragonfly. The exhibit debuted at the Dallas Arboretum in the summer of 1994. The success of the Big Bugs continues to be an intense and laborious experience of creative inspiration, discovery and invention. The Big Bugs exhibit now compromises 40 sculptures with 14 different subjects. David Rogers’ Big Bugs exhibition has now toured public and private botanical gardens and nature centers throughout the United States. The exhibition has been successful in its role in assisting host institutions in outreach in educating the public about the importance of preservation and conservation on the planet. The exhibition brings solutions to the challenged faced by botanical gardens and nature centers in building new membership, increasing existing membership participation and public attendance and awareness of their mission. Several botanical gardens have invited David Rogers’ Big Bugs to return for additional exhibitions. Since 1994, David Rogers’ Big Bugs has been privileged to be shown in 40 States. This entry was posted in All Talent, National and tagged Exhibition by admin. Bookmark the permalink.